Also called the Marvel-of-Peru, this antique flower was discovered by the Conquistadores in the 16th century. 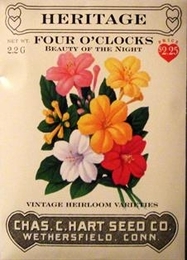 Favored by Victorian women for its fragrance in the evening garden. A prized plant for the evening garden, the flowers open late in the afternoon and produce a sweet orange scent that lingers into the night, blooming into the late fall. These bushy 2 foot plants produce best when grown in full sun. Sow seeds indoors using CowPots 6 weeks before last frost date to produce earliest flowers. Seeds require light to germinate, so do not cover with soil. Transplant outdoors 2 weeks after last frost has passed.